Research shows that there are greater benefits of participation in multiple sports as opposed to the high pressure of sport specialization. Glen Lake Athletics is an avid proponent of multi-sport student-athletes. Glen Lake Coaches are expected to be promoters of multi-sport participation, not single-sport specialization. 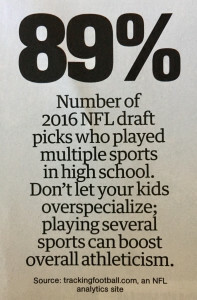 If any student feels that he/she is being pressured to focus on one sport only, he/she should contact the Athletic Office. Associated Press – Where Have The Multi-Sport High School Athletes Gone? Get key announcements and game updates from the official Glen Lake athletic calendar!